The only other chicken I have ever had sent to me was the one sent when I was born. It’s an Italian custom to be given a live chicken on the birth a child. Us living in England made no difference, we were gifted one regardless. The clucking chicken remained in the holed cardboard box for a few hours while my father, a bit of a softie, sat with it in the shed, bottling up the courage to kill it. When it was apparent that my father was going to wuss out and release the chicken free across the park over the road, the Italian women in the kitchen–with their firm but agile hands at the ready for plucking and gutting–rolled their eyes at him and one of them grabbed the chicken from the box and gave it a quick and efficient crack at the neck. Better than being mauled by a fox over the park anyway. 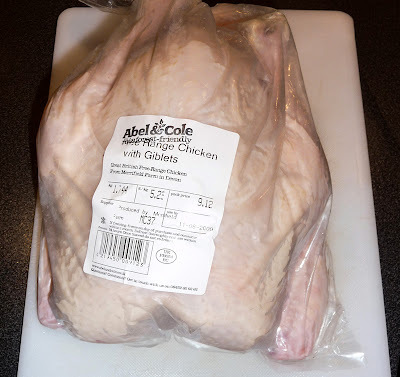 Abel & Cole sent me a (free) free range chicken, luckily this time it was already killed, prepared with the giblets inside and surprisingly packed in a polystyrene box with frozen packs around it. Not terribly eco on the surface of it but it is reusable and handy if you are not in and the bird has to stay fresh for a few hours on your doorstep. For £9.12 you get a 1.7kg bird from a chicken cooperative in Devon, made up of a few free-range farms. Mine was from the Merrifield Farm, and labelled rainforest-friendly which is a bit odd, but I guess that means it was not fed on rainforest destroying soya rather than raveshing the not so famous Devon rainforest. This then gives me convenient, ready prepped pieces for mid-week (oh, yes, check my organised bad self). 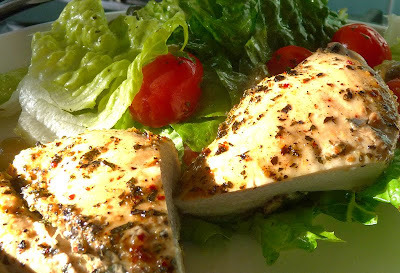 Typically, I use the breasts whole and marinated or flattened with a meat mallet and bread crumbed and fried. If we are being really frugal I cut them into a plethora of dishes like curries or stir fries, one fat breast off a decent bird is sometimes enough for two with everything else. Legs are roasted with lemon, garlic and spiked with thyme or made into a tasty cacciatore stew. And then you get a carcass and giblets! A carrot, celery, bay leaf and onion and you have a brilliant stock for an endless amount of recipes. If the stock comes out particularly well, I push the carrot, celery and onion through a sieve to puree and pour back into the stock with some finely shredded greens. Tiny little herbed pork meatballs are browned in a frying pan then cooked in the stock and then served with bread balls scattered on the top – the classic Italian Wedding Soup and cure for all ailments. For this particular A&C chicken, I decided to grill the breast pieces in a recipe from the fabulous new Eagle cookbook, in a simple marinade of lemon, chilli, fresh oregano and black pepper with a touch of truffle oil to taste test this bird. It was good but to be honest no different to many other good quality free range chickens I’ve tried. It sat happily in the middle of being a tasty, well textured meat, succulent and tender but I would expect that from the price. 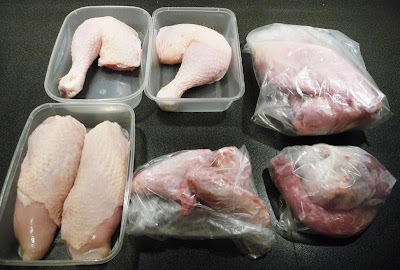 The chicken felt really firm and muscly when I was portioning it up and must have had some decent exercise. So yeah, I think the pricier but better chickens are well worth it and if you don’t live near a source or it’s inconvenient to get hold of a free range chicken then Abel & Cole may be a solution for you if you want one delivered or added to your order if you already get a veg box from them. But to be honest, as this chicken simply met my expectations and I can easily get good free range birds locally, and probably for a smidge cheaper, I’ll personally be sticking with those.